​How do I create and build my author platform? How do I build my fan base (tribe)? How do I market my book and myself as an author? How do I work social media effectively? What are the social media dos and don'ts? How do I manage the time to build my platform, market, and write? There are some many questions asked by new authors. So many new authors stumble in these areas and their sales numbers reflect that. This course will answer all of these questions. There are so many books published every day that are added to the inventory of already published books. This floods the market with loads of product for the consumer to choose from. For a new author to find success, they need to stand out. The internet is flooded with authors posting 'commercials' for themselves and their book. How do you break through all that and get noticed? Join us for some practical step-be-step actions you can do to help you get that platform built and working for you, learn how to promote and market yourself on a budget and without being a commercial or spammy, time management, and for some essential writing tips. Why are we adding in writing tips? Well, let's face it, if your writing isn't good, the rest of this is a waste of your time. This Writerly Corner Course will begin on April 18, 2016, and run for 6 weeks. The course will be conducted through a Blogger blog (Google login required). Each morning you will receive an email with the link to that day's lesson and assignment. Each day's lesson and assignment is worked by you at your own pace as you can fit it into your schedule and each day only requires about 30 minutes of your time, yet the information you will gain will be more than worth it. When you sign up, you will receive an automatic digital download that, in a PDF file, contains the materials list you will need for the course, the course overview, and a complimentary Novel Outline Tool Kit as our free gift for signing up. The course cost is $199.00, but, if you sign up before April 11th, you will pay only $79.60, a discount of 60% off the course cost, using the ​code 60OFF4U at checkout. Sign up below and don't miss this informative course packed with useful steps to improve your authorlyness. Reminder - a Google login is required to attend the course, so please sign up using the email address associated with your Google login. Don't forget to use the code 60OFF4U at checkout to pay only $79.60 and save 60% before April 11th! Read what previous attendees have to say about the course. "I was very impressed with the marketing and promotion seminar, and believe I learned quite a bit. I go back to my notes on it now and then, and each time I try something new. Most of the tips are excellent and quite pertinent to my needs, and I'd love to attend another course, particularly one taking me further in promoting my books." "The Writerly Course was extremely helpful to me as a new writer. It helped me to hone in on my self-presentation as an author, and showed me techniques on marketing my books. Ultimately, it helped me network with fellow authors, and gain confidence in my work. I am truly thankful that this course was put together." The Writerly Corner Course was not only beneficial in improving and providing me new tools for writing, it helped me to build my fan base through the marketing techniques taught in the course. I definitely recommend this course and am looking forward to the next one. So you’re writing a book, or finished it and it’s published. Being published does not mean you’ve made it. It’s just the beginning. Writing and marketing run hand in hand. Writerly Corner Online Courses offer support in both. I feel there are always new things to learn in developing all aspects of my novels and the search for marketing tools and techniques are never ending. 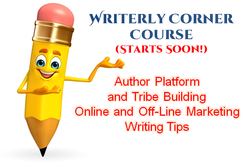 Writerly Corner Courses offer it all and I try to participate in all that they offer. All it takes is a commitment of your time inside your own home and if a busy life gets in the way, they encourage catch-up as you go. I highly recommend the current course offering, even if it’s to update what you already know. Besides, they are very reasonably priced. Meet other authors; share your thoughts and successes. I’ll be there. This course was most definitely a valuable learning experience and well worth every minute. I enjoyed learning things I didn't know and tweaking the things I thought I knew. I highly recommend it for any and all new authors. Wonderful course! Filled with lots of great ideas and information. Thank you! This is a FREE five day course. The dates has not yet been set. When course dates are determined, all who have registered will receive an email. This course will be conducted through a Blogger blog, so please remember to register with your Google login email address. Is your Work in Progress shaping up to be a great story or will it be just a good story? In order for your written work to have any hope of getting the attention you want, you will need to write a GREAT story. With the number of books published every day, the world doesn't need another good story, we need more GREAT stories. This course will walk you through dissecting your WIP for five vital components that are imperative in GREAT stories. You will receive a link to the course material via email every morning for five days. Work at your own pace. We hope you find the course enlightening and helpful! ​Sign up for the course below.